1. Bring Fall/Winter items only–accepting only items that are not stained, faded, in need of repair, or out-dated (purchased new within the last 2 years). 4. Only bring 10 items of maternity clothes. No ladies clothing. 6. Button all buttons, zip all zippers, tie all sashes/belts, and snap all snaps. 7. Use only wire hangers. We have some extras available. They will be in a plastic container on my front porch. Help yourself without even calling (email us for the address info@theconsignmentsale.com). I am not aware of any hangers that you can buy that are plain wire without plastic or rubber coating. The plastic ones break and are too bulky; the coated ones do not slide easily on the racks. Some dry cleaners in town have hangers available. 8. Hang the garment so that the hanger makes a ? when looking at the front of the hanging garment. (see picture at #10) Make sure the garment does not slip off the hanger (or guess where it will end up!) You may use safety pins to secure a garment to the hanger only if necessary, but not for pinning on the tags. Small sizes that do not fit on a standard hanger should be pinned by the shoulders in the same manner as pants (#9). 9. 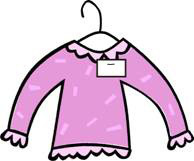 Pants, skirts, swimsuits (during spring/summer sale only), and dress up costumes should be safety-pinned so that the front of the garment is facing the shopper. Do not fold them over the hanger. Tip: use hangers with the cardboard tube or ones covered with paper to hang pants, skirts, and costumes. This keeps the garment from bunching up in one corner and getting tangled with other hangers. Always pin the garment to the slanted part of the hanger with a strong safety pin. The little gold ones do not hold. DO NOT USE STRAIGHT PINS TO HANG PANTS, SKIRTS, and COSTUMES. 10. Please print out your tags on 60-67# white cardstock and attach to the item. Regular copy paper (20lb) tears very easily and does not stay pinned to your item. *Clothes – Use a straight pin to pin the card to the left shoulder (right side if you are facing the garment on the hanger) of the garment. (This is the only time you will use a straight pin.) Stick the pin in through the top of the card, through the garment, back up through the garment, back through the card, and then stick the tip of the pin through the card only so that it is not on top to damage other clothes. (3 sticks of the pin) PLEASE NOTICE THE CORRECT WAY TO HANG YOUR CLOTHING…HOOK OF HANGER MAKES A ? OR 2 WHEN LOOKING AT FRONT OF HANGING GARMENT. *Plastic, wooden, or metal toys/vinyl raincoats/videos – Use clear packaging tape to secure the card to a spot that will not remove any stickers or decorations when it is peeled off and will be easily seen by shoppers. Do not completely cover the card with the tape. The bar-code must NOT be covered with tape. One short strip across the middle will do. *Any non-hanging, cloth item such as dolls/car seats/strollers/hair bows/hats/ties/diaper bags/bedding/bibs- Use a safety pin to secure the card to the item. These types of items tend to be handled more frequently causing the straight pin to come out. 11. Toys, etc. with more than one piece – If there are two or three big pieces; a table set, for example, fasten the tag to the main part of the item, the table. Then hand write the extra tags to label each chair. DO NOT put a price on the extra tags…just the item number and description. Ex. – printed:#131 Pottery Barn White Toddler Table and Chairs 1/3 $25.00…(handwritten: #131 chair to PB white Table and Chairs 2/3). Only put price on the main printed card. 12. Toys with lots of small pieces – A doll house, for example – Fasten the tag to the doll house. Then put all the accessories in a clear Ziploc bag. Tape the bag shut. No staples. Use a permanent marker to label the bag with your Consignor # and brief description. Ex. – #131 Playschool doll house accessories. 13. Toys with only small pieces – several Matchbox cars, for example – Secure all the pieces in a Ziploc bag as above. Use clear packing tape to secure the tag to the outside of the bag. No tags inside the bags. 14. Socks/tights – Use a Ziploc bag as mentioned above to sell more than one pair together. These are the only cloth items that can go in a bag. Secure tags outside the bags. Again, do not cover the entire tag with tape. One strip across the middle will be enough. 15. Newborn gowns and sleepers – These sell better as sets. Pin 2-4 together as one set on a hanger with one tag that shows the price for the set. Look for formula stains! Do not put in baggies. 16. Bibs – Sell as sets if possible. Safety pin the tag. Do not put in baggies. 17. Do not hang bedding, diaper bags, receiving blankets, towels, etc…Only hang clothes.